What They Say.....The unmissable and highly original new thriller from the author of the international phenomenon The Girl with all the Gifts. Fellside is a maximum security prison on the edge of the Yorkshire Moors. It's not the kind of place you'd want to end up. But it's where Jess Moulston could be spending the rest of her life. What I Say....I never did read The Girl With All the Gifts, even though I wanted to and everyone raved about it. 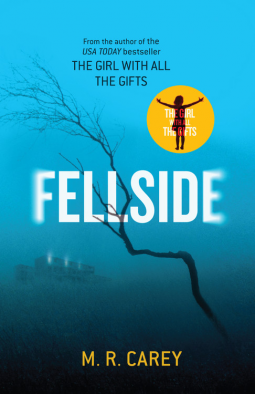 So I was really excited to get an ARC of Fellside by M.R. Carey. It was a really unusual story. Jess is a junkie, addicted to heroin and a bad boyfriend. She has a passing relationship with the little boy upstairs, she feels vaguely sorry for him, although he probably has more reason to feel sorry for her. One day, Jess wakes up in the hospital, recovering from burns and not much memory of what has happened to her. As she pieces things together, she finds that she is going to trial for purposefully setting a fire in her apartment building, which ultimately led to the little boy dying. Jess wants to pay for her sin, so refuses to defend herself, she just wants to die. She goes on a hunger strike and brings herself to the brink of death, but then has a visit from the little boy who she thinks she killed, and he wants her help to find the real killer. The rest of the book is set in a women's prison (not my favorite setting) and many parts of it were reminiscent of "Orange is the New Black" without the funny bits. There are judgmental nurses, corrupt guards and inmates running drug rings. All of their lives overlap with each others, even when they don't want to be involved. Towards the second half of the book, it almost read like a fever dream. The little boy evolves into something else, Jess continues to try to do the right thing, although her life is continually in danger. It was an extremely different read, not my normal cup of tea, but it stays with you.